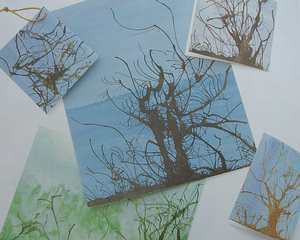 Such wonderful branched trees are produced with simple poster paints. These bizarre pictures make unusual cards, pictures and gift hangers. Each motive is really an original. Take a sponge in your hand and moisten both sides of the card with water. Cover the card with sticky tape on a smooth flat surface so that it does not curl up. Smooth any wrinkles out with a sponge. When the paper is dry you dip the sponge in blue-green paint and blot the background onto the paper. With a pipette, you apply the black or brown colour to the bottom edge of the card. Blow the wet paint through a straw to make the trees branches. Once dry, carefuly remove the sticky tape. Now you only need to trim the edges and your individual tree fantasies are ready.